In budget address, how ambitious will Gov. Tom Wolf be? Gov. Tom Wolf will give the first budget address of his second term on Tuesday. Here’s what to know and what to watch for. The big question: How ambitious will Wolf be? That is what Chris Borick, a pollster and political science professor at Muhlenberg College, is wondering. Wolf, a Democrat, won re-election by a wide margin in 2018. But he is still facing a Republican-controlled General Assembly. 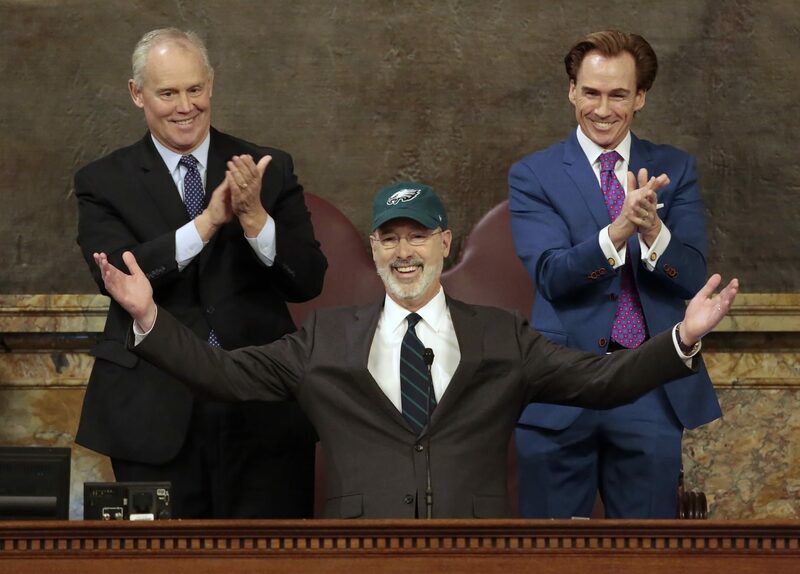 The tone: Last year, Wolf started the speech by putting on a green Philadelphia Eagles hat. The move — honoring the recent Super Bowl champions — led to cheers and a standing ovation. Maybe that was a sign of things to come, as budget negotiations went relatively smoothly last year. In June, Wolf signed a budget for the first time as governor. It was also completed on time. This year, the Eagles didn’t reach the Super Bowl. So a unity hat move seems unlikely. And the question is whether the Republican-controlled General Assembly and Wolf are looking to take a hard line in upcoming budget negotiations. The deficit: In November, the state’s Independent Fiscal Office projected a $1.7 billion budget deficit for the 2019-20 fiscal year. That deficit is driven in part by rising costs and an aging population, the IFO concluded. But the situation might not be as bad as that figure suggests. Republican leaders and the Wolf administration have said they don’t believe the deficit will be as large as the IFO forecasts. And Matthew Knittel, director of the office, said that $1.7 billion deficit figure assumes no one-time measures are used to balance the budget, such as payment delays, temporary transfers or shifting sources of funding. 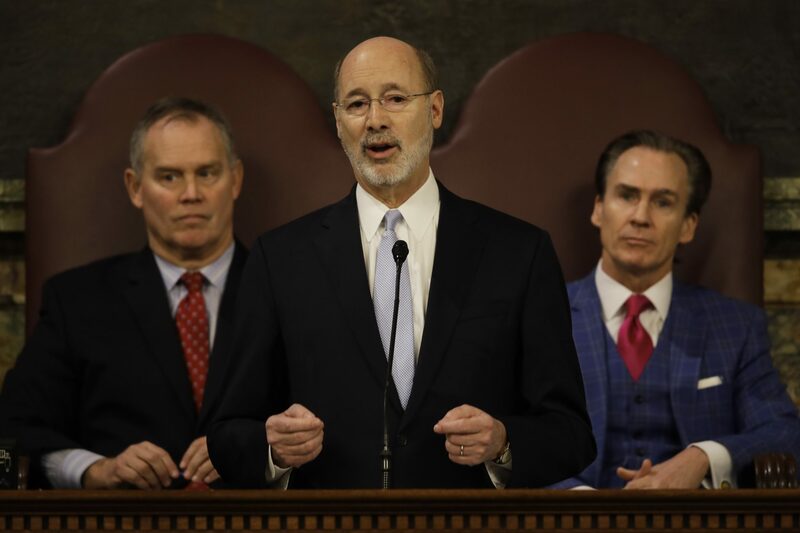 Taxes: In his first budget address, Wolf proposed major tax changes. He wanted to raise the personal income tax rate, raise the sales tax rate, expand what is covered by the sales tax, lower the corporate net income tax rate and reduce property taxes. Those big changes didn’t pass. “Four years ago, he went for the moon in terms of major structural reforms and ended up getting nowhere,” Borick said. Instead, Republicans and Wolf agreed agreed on a number budget transfers and targeted tax increases, such as raising and expanding tobacco taxes, expanding the sales tax to cover digital downloads, and expanding the personal income tax to include Pennsylvania Lottery winnings. They also expanded gambling. During the 2018 re-election campaign, Wolf said he didn’t have any plans to raise the sales or income tax rates. Gov. Tom Wolf delivers his budget address for the 2017-18 fiscal year to a joint session of the Pennsylvania House and Senate in Harrisburg, Pa., Tuesday, Feb. 7, 2017. Speaker of the House of Representatives, Rep. Mike Turzai, R-Allegheny, is at left, and Lt. Gov. Michael Stack, is at right. Other revenue and fees: In 2017 and 2018, Wolf proposed a fee for municipalities that rely on state police coverage. The measures failed to gain much traction. The question is whether Wolf will bring back that idea — or other targeted measures. Education spending: In 2014, Wolf’s campaign focused on raising education spending. And since he’s been in office, lawmakers have approved hundreds of millions of dollars more for schools. It’s not clear how much Wolf will seek for education funding in this upcoming budget address, although in a Friday email, Wolf’s press secretary, J.J. Abbott, indicated it would remain a top priority. Severance tax: Wolf has proposed a severance tax in all four budgets. None of those severance tax proposals passed. Last week, ahead of the budget address, Wolf proposed a $4.5 billion package to send money directly to infrastructure improvements. The plan relies on a severance tax on natural gas drilling and borrowing money, and it is being introduced separately from the annual budget process. House Republican leaders released a statement opposing the idea. “The governor’s proposal includes three of the worst ways to grow an economy: taxing, borrowing and uncontrolled government spending,” they said. Minimum wage: Wolf has proposed minimum wage increases in his previous four budgets. None has passed. An increase to $12 per hour this year, followed by 50-cent increases until the minimum wage reaches $15 per hour in 2025. Then the rate would be tied to inflation. At the news conference, Wolf indicated the move would be part of his budget proposal. And part of his pitch is that the move would lead to fewer people receiving government assistance, and thus save taxpayers $36 million in Medicaid costs next year and $119 million the following year. Republican leaders don’t appear enthusiastic for the proposal. Guns: Wolf hasn’t focused on guns in past budget addresses. Former Democratic Gov. Ed Rendell did. In Rendell’s 2007-08 budget address, he said that while reducing gun violence wasn’t a formal part of a healthcare and economic development plan he was proposing, it was necessary. Wolf has supported increased gun restrictions, including expanded background checks and the introduction of extreme-risk protection orders. Last week, he appeared at a rally in the state Capitol with supporters of increased gun restrictions. Other priorities: In an email Friday, Wolf’s press secretary also pointed to some priorities, including responding to the opioid epidemic, but didn’t get into specifics. The background: In past budget addresses, Speaker of the House Mike Turzai and Lt. Gov. Mike Stack sat behind Wolf as he delivered his remarks. This year, Stack will be replaced by the state’s new lieutenant governor, former Braddock Mayor John Fetterman. The odds seem high that someone will make a comment about Fetterman wearing a tie.